Beneath a starlit, moonless sky, survivors drift in lifeboats, cling to wreckage, and call desperately for help. The freezing waters take their breath away, make them shiver uncontrollably, and gradually sap away their lives. 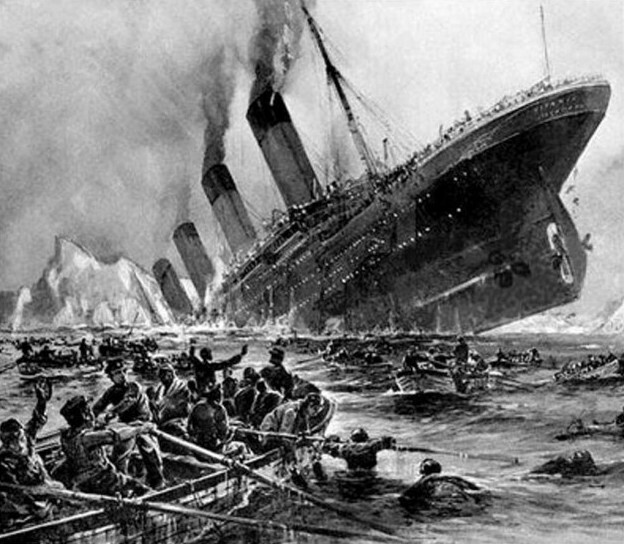 The once-indomitable Titanic has sunk beneath the waves, taking with her over a thousand people. Now all the survivors can do is hope. It’s the night of Sunday, the 14th of April, 1912, and the grand, luxurious White Star Liner, the Titanic, has struck an iceberg on her maiden voyage across the North Atlantic. She quickly takes on water and the order is given to launch the lifeboats – women and children first. First class passenger and newlywed, Mrs Helen Bishop, later gave her account of the sinking. “The water was like glass. There wasn’t even the ripple usually found on a small lake. By the time we had pulled 100 yards, the lower row of portholes had disappeared. When we were a mile away the second row had gone, but there was still no confusion. Indeed everything seemed to be quiet on the ship until her stern was raised out of the water by the list forward. Then a veritable wave of humanity surged up out of steerage and shut the lights from our view. We were too far away to see the passengers individually, but we could see the black masses of human forms and hear their death cries and groans. In one of the lifeboats, children were comforted by a musical toy pig owned by passenger Edith Rosenbaum. It had been thrown into the lifeboat by a sailor when Edith was reluctant to leave the Titanic. The music was used to distract the children from the screams of the dying. Lifeboat number 7 had been the first to leave the Titanic. With a rated capacity of 65, it carried only about 32. Eventually, at around three in the morning, the lifeboats began to gather together. Some of the survivors in boat 14 were transferred to other boats, so that Officer Lowe could take it back to look for survivors. They were able to pull six from the water, barely alive by then, and rescue about a dozen survivors from Collapsible Boat A, which had been swamped by a wave when launched. Eight of those who had made it onto this boat had already succumbed to the freezing cold. They were left in the boat, and set adrift. Collapsible Boat B had also suffered terribly; it had been dropped, upside down, then washed overboard before it could be righted. It had then provided a terrifying and uncertain haven for some thirty men who had managed to swim out and cling to its hull, but they had turned many others away. Lifeboats 4 and 12 eventually took these men aboard. Perhaps the luckiest survivor was one Mr Hoyt. After seeing his wife off to safety aboard Collapsible Boat D, he had jumped into the ocean to swim, in the dark, to where he guessed it might pass. He was right, and he was pulled on board to safety. The first of the lifeboats was met by the Carpathia at four am, but others were not located for several more hours. In boat no. 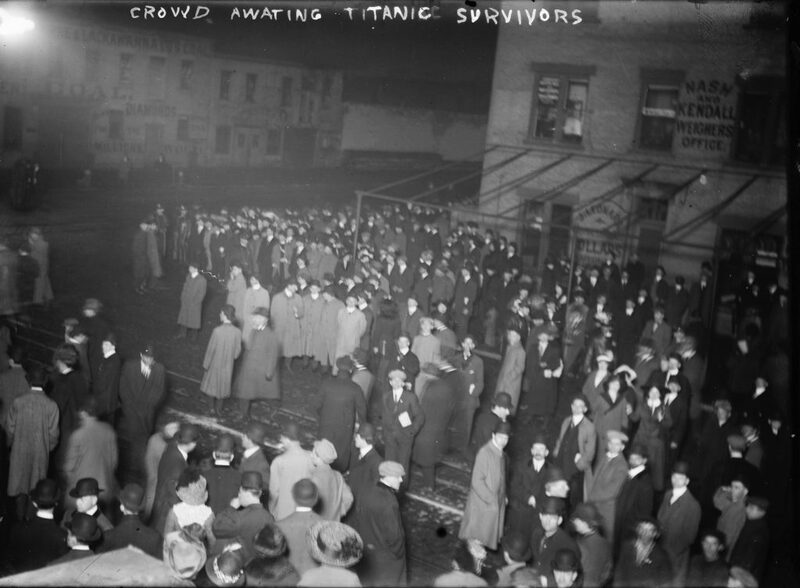 12, the last to be retrieved, passenger Lillian Bentham described the scene. They were too late on that front. Sensational and exaggerated statements were already being published; not to mention inaccurate ones. The Evening Star announced that all had been saved from the Titanic after a collision, and the International Mercantile Marine company – owners of the White Star Line – issued a statement of complete confidence in the Titanic’s ability to withstand any damage. By around 6pm, however, the mood of optimism ashore was dampened by a widely intercepted message from the Olympic to the White Star Line giving the number of survivors as only 675. This was later amended to 705; the survivor’s committee said 775. The true number of casualties is, to this day, somewhat unclear. The passenger lists included the names of some who had cancelled at the last minute, and some passengers used aliases to board for various reasons, then gave their real names as survivors leading them to be counted twice. The British Board of Trade report finally put it at 1,514, with just 710 survivors. The casualty lists showed certain inequalities. Thanks to the “Women and Children First” order, 75% of the female passengers and 50% of the children aboard survived; only 20% of the male passengers made it out. The main obstacle, it seemed, was essentially the distance and a lack of knowledge; first class passengers were housed a lot closer to the boat deck, and knew where it was, whereas a lot of third class passengers just couldn’t find their way there in time. While inquiries began on both sides of the Atlantic, campaigns were started to raise a relief fund for the survivors. Collection boxes took donations in the streets, charity soccer games took place, and there were even charity records released – yes, that’s right, that particular idea was around more than 70 years before Band Aid. Some of the male survivors came under particular scrutiny. 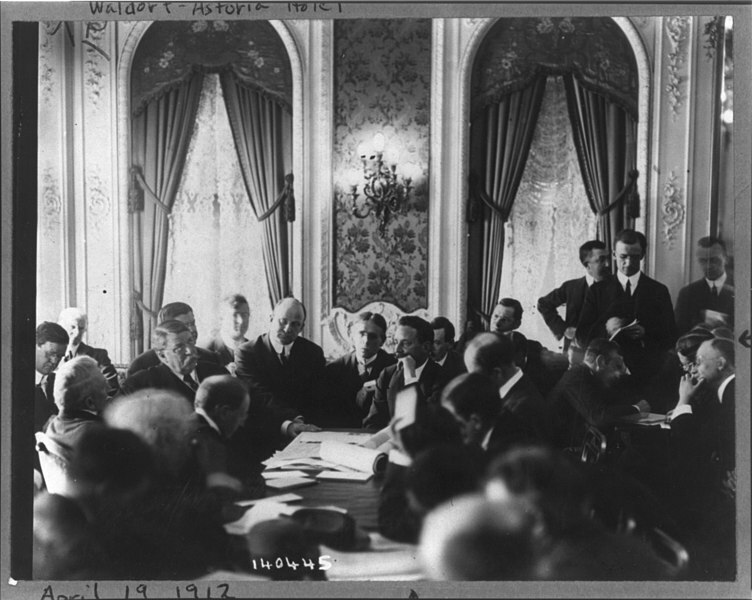 J. Bruce Ismay, chairman of the White Star Line, was quizzed at length by the American Senate hearing into the tragedy, as well as the British inquiry. Many people felt that he should have gone down with the ship, as Captain Smith had. There were also implications that he had encouraged the Captain to maintain a dangerous speed, which he denied, saying that there was “nothing to be gained” by arriving in New York any earlier than arranged. Sir Cosmo Duff-Gordon, alongside his wife Lady Lucy, had escaped aboard Lifeboat no. 1, and the fact that he had paid the crew aboard that lifeboat five pounds apiece was undisputed. The reason for it, however, was widely debated. Some claimed that it was a bribe, inducing the crew to row away from the ship instead of returning for survivors. He maintained that it was a gift, in gratitude to the crew and to cover the loss of their belongings. Another major feature of both inquiries was, of course, the identity of the ship seen by the Titanic, which failed to come to her aid. Were other ships closer than the Carpathia, and could they have saved more people if they’d responded? One ship in particular came to the forefront. The Californian, a cargo liner, had encountered ice on her journey from Liverpool to Boston and had come to a stop until it cleared. According to her recorded position, and the position established by Fourth Officer Boxhall aboard the Titanic, the Californian was less than twenty miles away from the stricken ship. The Californian, however, didn’t hear of the tragedy until morning. Their wireless operator had shut down his radio and gone to bed before the distress call came in – there was no requirement to have transmissions monitored 24 hours a day. But they did see something that night; they saw the lights of another vessel and attempted to make contact by signal lamp, with no success. Later, Second Officer Stone saw what he took to be signal rockets in the distance. Captain Lord asked to be kept informed, but took no particular action. It was 5:30 in the morning by the time the radio equipment was turned back on and the news was finally received; realising their proximity, the Californian made their way directly to look for survivors. They met a Canadian Pacific liner, the Mount Temple, at the reported position of the wreck, but found nothing. The position broadcast by the Titanic was wrong, by about thirteen miles. Continuing south, they then met the Carpathia, who had already retrieved the survivors, having fortunately encountered them on their way to the incorrect location. The Californian remained to continue the search whilst the Carpathia took the survivors to safety. It’s important to note a few points here. The Mount Temple had picked up the distress calls before 1am, an hour before the Titanic had finally gone down. They were about fifty miles away at that point, and had moved to the rescue straight away, but they had moved cautiously, and eventually stopped for fear of the ice they were encountering. The Californian, meanwhile, hadn’t received a distress call; the rockets they saw may have been from the Titanic, but they didn’t know what they were seeing at the time. So, the Mount Temple stopped, even though they knew the Titanic was going down somewhere nearby, but it was the Californian, and Captain Lord, that became the scapegoat because they found out too late. And there’s evidence that neither ship was actually the one sighted by the lifeboats that night. In 1962, the chief officer of the Norwegian sailing barque Samson swore that they had been in the area. He stated that they had seen the Titanic’s distress rockets but sailed away as they had been sealing illegally on the Canadian coast, and feared the rockets came from a customs boat. Official records show that the Samson was in Icelandic waters at the time, but of course they wouldn’t have recorded their real location if they were off breaking the law. Another fishing ship, the Dorothy Baird, was also known to be in the area somewhere, but it’s not known exactly where. Neither of these ships had a radio with which they could have picked up the Titanic’s distress calls, and even if they had been able to meet the Titanic, they were too small to take on many survivors. The American committee published its report on the 28th of May 1912, spotlighting the lack of lifeboat capacity as well as the inexperience of the crew launching them. It’s worth noting, though, that at the time she sailed the Titanic actually exceeded the number of lifeboats required for a ship of her size. They also criticised Captain Smith’s conduct in steaming ahead through a known ice field, and the British government for their inadequate foresight. 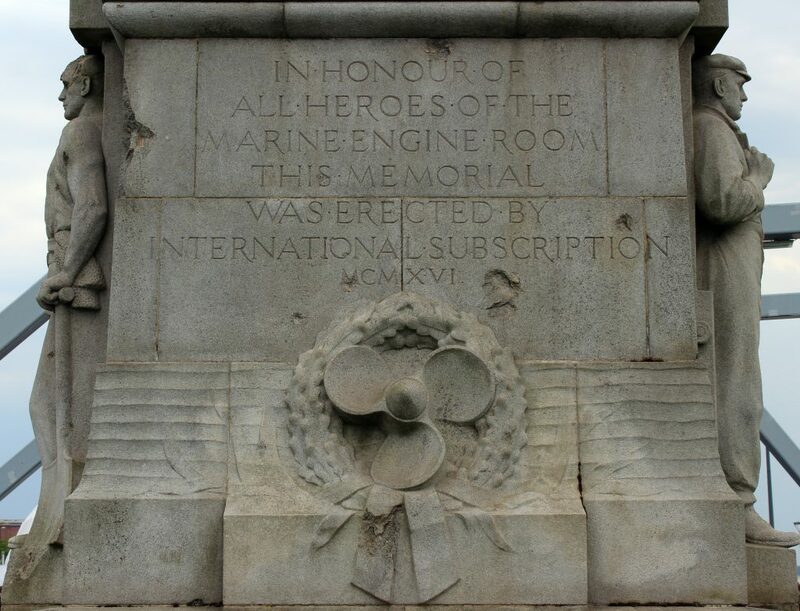 The Memorial to the Heroes of the Engine Room in Liverpool was commissioned after the sinking of the Titanic. They had praise for the ship’s engineers, whose devotion and sacrifice ensured that the lights stayed on for the evacuation, as well as commending the bravery of the band and the wireless operators. Captain Rostron, of the Carpathia, was highly recommended for his part in the rescue. The British Board of Trade inquiry, which began on the 2nd of May and published its findings on the 3rd of July, disagreed on certain points. Although they found that the Titanic’s speed was excessive in the conditions it met, they didn’t find Captain Smith negligent. Respected mariners had testified that it simply wasn’t accepted practice to slow down when ice was around – they worked on the premise that it was better to get out of the ice field as quickly as possible. The British Board of Trade was criticised for not keeping their regulations up to date with progress, specifically with regards to the lifeboat numbers. Both inquiries laid blame on the shoulders of Captain Lord of the Californian, effectively implying that he was responsible for the great death toll of the tragedy. Whether this is true or not will probably be debated for many years to come. They certainly could have responded faster if their radio had been manned constantly, but they would still have received an incorrect location for the Titanic, and it’s impossible to say for sure whether they would have found the ship in time. The inquiries also both offered recommendations for improving the safety of one at sea. Aside from the very obvious point about providing enough lifeboats for everybody on board, it was recommended that there be more frequent lifeboat drills, that wireless stations aboard ships be monitored around the clock, and that a more southerly route across the Atlantic should be used. The International Convention for Safety at Sea in 1913 would adopt these measures, alongside adding ice patrols for the shipping lanes. Finally, the British inquiry noted that there was a fundamental flaw in the design of the Titanic’s safety systems; the bulkheads which were supposed to prevent flooding extending across the ship simply didn’t go high enough, and the compartments weren’t independently watertight. Once one was filled, and the ship was consequently weighed down, the water could simply overflow into the next. This meant changes to the third ship, the Britannic, whose construction had been halted for the duration of the inquiries. They made major modifications to the design, bringing five of the watertight bulkheads all the way up Deck B, increased the depth of the double bottom and incorporated a full double skin to the top of the watertight bulkheads. Extra riveting strengthened the hull, and she was equipped with new gantry davits for the lifeboats, which made launching them easier and allowed for the provision of more lifeboat capacity. One last change was made. The name. She was originally going to be called the Gigantic, but in light of the Titanic’s loss it seems they thought a name with a little less hubris was in order. She went on to serve a suitably patriotic duty as a hospital ship in the First World War, but met a similar fate to her more famous sister when she struck a naval mine off the Greek island of Kea, and went down with the loss of thirty people. And so, while people debated the whys and wherefores of the tragedy, the Titanic rested in peace at the bottom of the Atlantic Sea. Although salvage plans were mooted straight away, the depth at which she lay and the technology available made it impossible. Then came the First World War, and then the Second, with little money or time in between to attempt locating the great wreck. Interest in the Titanic’s resting place was revived in the fifties, though. One British company even spent a week looking for her, recording the sound waves of undersea explosions in an attempt to triangulate her location. It would not be until 1985 that any successful expedition would be launched. Under the joint leadership of Dr Robert Ballard and Jean-Louis Michel, they used a submersible sled called the Argo which could not only scan the area with sonar but also relayed high quality video back to the researchers. In the early hours of the 1st September, Ballard was roused from sleep to see one of the Titanic’s huge boilers looming out of the darkness. They weren’t able to fully survey the wreck at that time, but they did find that her forward section was sitting upright on the ocean floor, reasonably intact, while the stern had broken away and lay some 600 metres away with most of its decks collapsed onto each other. 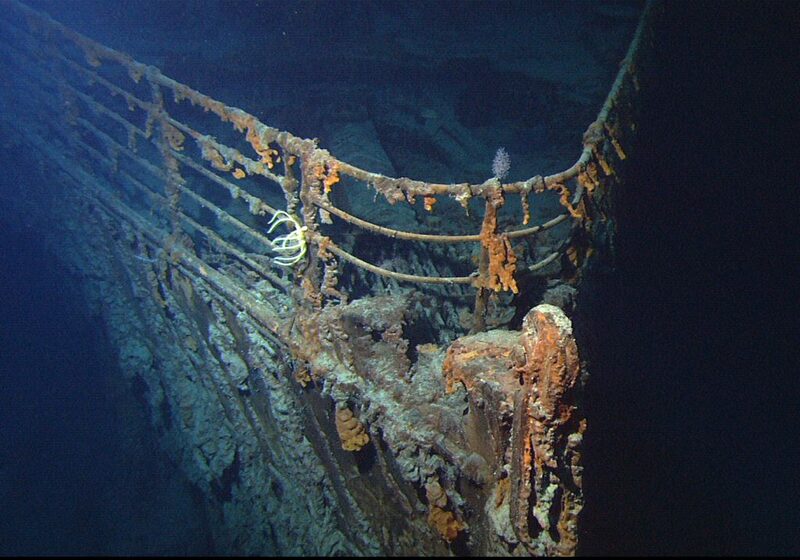 Despite this, in the intervening years many expeditions have been made to the Titanic, and salvagers have brought everything from her silverware to parts of her hull up to the surface. These expeditions have brought enlightening facts to the surface, too. It was originally thought that the iceberg had cut a great gash in the side of the ship, allowing water to flood in. However, if that had been the case, it’s likely that she would have gone down a lot quicker. In 1996, an investigation in partnership with the Discovery Channel confirmed that the area of damage was only 12.6 square feet. The collision that sank the Titanic was one of a kind. It hadn’t happened before, and it hasn’t happened since. So could it have been avoided? Could the Titanic have been saved? Perhaps. If they had been going slower, they might have had more time to react when the iceberg was sighted. However, it has also been theorised that the cold conditions that night had led to a kind of optical illusion which stretched the horizon into a hazy band, so even at a slower speed it may have been impossible to spot in time. 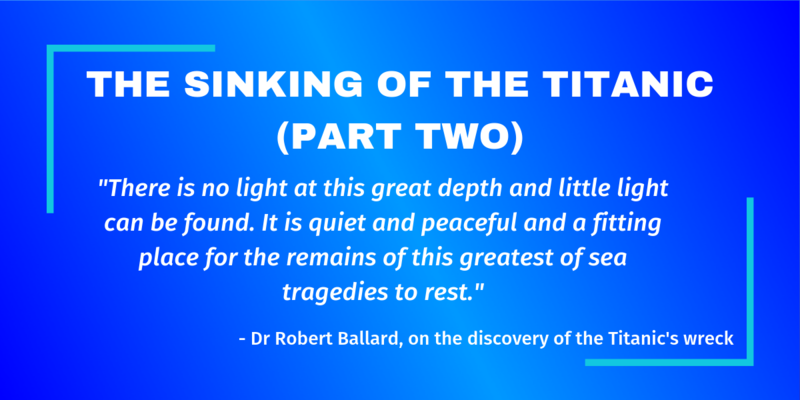 If they hadn’t tried to steer around the iceberg, and had struck it head on, the ship may not have gone down – there would undoubtedly have been casualties and severe damage to the Titanic, but it could have been restricted to the forward compartment, allowing her to remain afloat. Of course, hindsight is a wonderful thing. The fact is, Titanic’s loss dented the shipping lines’ supreme confidence in their technology, which led to many improvements in safety at sea and in turn may have saved lives on the ships who sailed after her. A small comfort, perhaps, for those who now rest with her.